I. Origin of kissing; the Scandinavian tradition; an old poet’s idea—Kissing in ancient Rome, and among the Jews and early Christians—Biblical kissing—Religious significance—Kissing in early England—Ancient kissing customs as described by Erasmus—The puritanical views of John Bunyan—How Adam kissed Eve—A kiss defined: By the dictionary, Shakespeare, Robert Herrick, Sidney, Coleridge—Comical and short descriptions—A grammar of kissing—The scientific reason why kisses are pleasant. II. How to kiss—The act fully described—Size of the mouth to be considered—Large mouths and those of the rose-bud sort—The girl who claws and struggles—Poetical directions—Dangers of hugging—Tapping the lips of a Mexican senorita—Kissing a Chinese girl—How to receive a kiss—Long-remembered kisses—The kiss in betrothal and marriage. III. 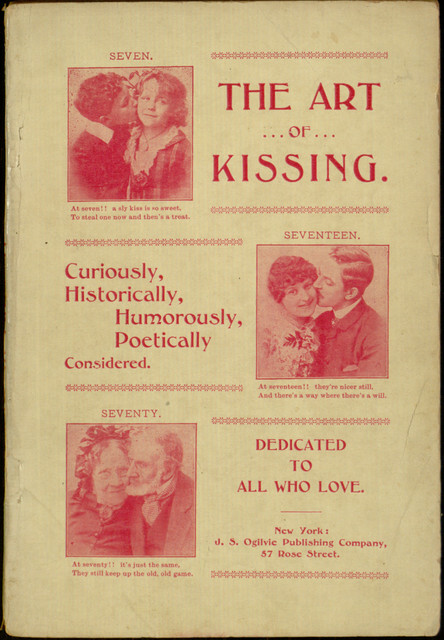 The significance of kisses—The kissing of hands in religious ceremony and social life, in ancient Rome, Mexico and Austria—The politic achievement of a kiss—An indignant cardinal—A kiss within the cup—Something about lips, the sweet petitioners for kisses—Dancing and kissing—An Irish kissing festival—Electric kissing parties—Kissing under the mistletoe—New year’s kissing in old New York—A Western kissing bee. IV. Kissing in different countries: In Arabia, Egypt, Russia, Finland, Iceland, Paraguay—A pleasing but perplexing Norwegian custom—The “blue laws” of Connecticut—Kissing in the eyes of the law—Money value of a stolen kiss—Sanitary dangers of kissing—Kissing the dying—Famous kisses—The Blarney Stone—Soulful kisses—Kissing the feet of beggars. V. Different kinds of kisses: The long, long kiss, the paroxysmal, the icy, the Western, the life-teeming kiss—How college girls kiss—The kiss of a female cornetist—Platonic kisses—Roman osculation—Characteristics of kisses—The kiss as a punishment—The king of baby-kissers—The kiss after marriage—Stolen kisses, sometimes called “dainty bits of plunder”—The story of a Circassian girl. VI. Men kissing each other in France, in England, and in Germany—Origin of the custom of kissing the Pope’s toe—Henry IV. and his punishment—Kissing the feet of royalty an ancient custom—Kisses as rewards of genius—The part osculation has paid in politics—Curious bargains for kisses—What legally constitutes a kiss—A kiss at auction—Giving $50 to kiss Edwin Booth. VII. Excuses for kissing; how all nature justifies the practice—The childish and the humorous excuse—Kissing casuistry—The gluttony of kissing; unaccountable osculatory demands—Excuses for not kissing—Kissing experiences—Dominie Brown’s first kiss—The kiss of the Spanish girl, the nurse, the mother—A curious German custom. VIII. The important consequences connected with kissing—Arrah-na-Pogue—Refusing the sacrament on account of a kiss—How a child’s kiss affected the course of a desperate man—What a little mare’s kiss did—Brought to life by a kiss—The kiss of death—Kissing in tunnels—A mountain experience—Kissing the cook. And in case you are keeping score, yes, the book does share some of St. Augustine’s wisdom on the subject. The entire book can be read online or downloaded through Project Gutenberg.